I was visiting my mom over spring break this year and we happened to run into her neighbor, a mother of 6 (7?) who homeschools her children. We got to talking about homeschooling and educating our children in general, and I told her that though I do not homeschool, I have always left it open as an option should I feel the need arise (either because of a child struggling in school or school turning into a negative environment for whatever reason). 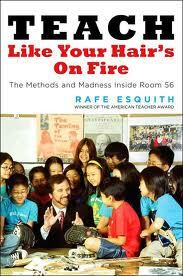 She recommended that I read, "Teach Like Your Hair's On Fire" by Rafe Esquith. She told me that he was a remarkable teacher and that reading his book had really inspired her to be a better teacher to her children. Well, even though I don't technically homeschool, I am always interested in ways to teach my children at home, and I love motivational books, so I decided to check this book out. Let me say, I can understand where she was coming from with her positive comments about this book! I found it to be very motivational and inspiring, and in fact I think that every teacher in America needs to read it and learn from this guy. - Education is about life, not about grades. Esquith constantly demonstrates in his book that the activities that take place in his classroom are not about getting good grades or even mastering the subject matter- they're about taking responsibility, learning teamwork, organization, and problem-solving, and building life skills that will benefit you as an adult. - Subjects are not mutually exclusive. Esquith teaches math with music, literature with history, and so on. He recognizes that every moment the students have in his classroom is a precious moment that should not be wasted, so he makes the most out of every lesson and activity. - Tests are sneaky. Esquith does this great exercise to prepare his kids for standardized tests: He puts a math problem up on the board, say 247-89 = ?. Then he writes a. b. c. d. He asks students for answers to put next to each choice. First c. 158 - the right answer. Next, d. 336 - that's for the kid who added instead of subtracted. a. 178- for the kid who forgot to borrow correctly. b. 258 - for the other kid who messed up the borrowing. He teaches them that they might do the problem and get an answer that's listed under the possible options, but they still need to double-check their work because the people who make the tests know all the pitfalls and put trick answers in to catch them. Smart! - Get out of their way. Esquith constantly emphasizes in this book how independent his students become under his guidance. He truly teaches them to take ownership of their own lives, their own education, and their own problems. He reminds us that we're raising adults, not children. - Expect more. Esquith asks, Why shouldn't a 5th-grader get passionate about Shakespeare or create complex works of string art or learn to read music? Kids have a greater capacity to learn and understand than you might think. These are just a few of the great tidbits I got from this book. Really, my only criticism of the book (aside from the fact that the intensity of his methods are simply not reasonable for most teachers) is that he didn't go into more detail, like with the 6 Levels of Moral Development- he never really explains how he implements this level of thinking and reinforces it during the year. At times I felt like he wrote this book like his hair was on fire! I certainly hope to see more from him in the future (although he's so busy I'm not sure how he even got this book written- which is probably the reason why it was so succinct!) because I feel he has a lot of great insights. Overall, it was a great read that definitely gave me a lot to think about, and I bought it for my kids' teachers as their year-end gift. I will probably also purchase it for their new teachers next year at the beginning of the year, because this is the kind of thinking I'd like to see more of in our classrooms. I truly feel like teachers, just like anyone else, get stuck in a rut and need to open new avenues in their brains. Books like Teach Like Your Hair's On Fire are a great way to do that. Do you homeschool? Have you read this book? What do you think of Esquith's methods? How do you feel about the condition of public schools in our country? Will you be doing any educating at home with your kids this summer? I do homeschool, but I've never heard of this guy! Thanks! Also... The "tests are sneaky" bullet point? Awesome. Such an ingenious approach to the testing culture we live in! Gina, I agree. I love that by teaching that way he prepares kids for tests in a way that makes them feel "smarter than the test." He wrote that he often hears kids chuckling to themselves while taking tests because they recognize the tricks that the test-makers included. Way to build the kids' confidence and make test-taking less of a chore! We homeschool and love it. I have some quibbles about public education, but mostly we homeschool because we feel it's better suited to our son's learning style and job situations for my husband and myself allow for it. I'll have to read up on this guy. Sounds like a great reason to homeschool! I always warn my kids' teachers that I'm going to be nosy. I've heard too many horror stories about the things that go on in classrooms, so I try to get into each kid's class at least once a month. I like getting to know the teachers and their teaching styles, seeing how they interact with my kids, and getting to know my kids' friends and their classroom environment. Plus, the teachers appreciate the help and goodness knows they need all the support they can get! Sounds awesome! Loved the video. I think I'll have to go out and buy a few copies too! Thanks for the book review Kasey. I really loved the utube and am interested to read it now. Maybe I can work these into our summer too! Thanks!